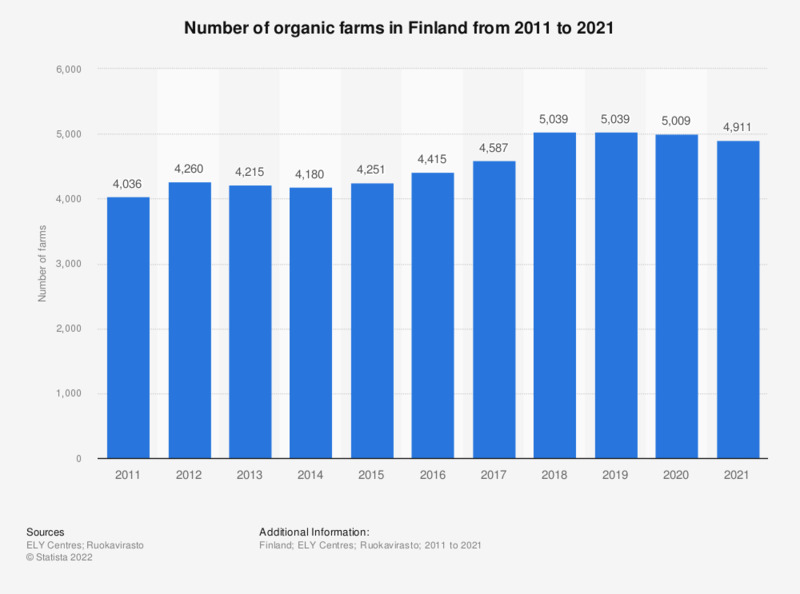 This statistic shows the number of organic farms in Finland from 2010 to 2018. Over the survey period, the number of organic farms fluctuated. According to the preliminary figures and estimations, the number of farms was expected to amount to over five thousand in 2018. This would indicate an increase of approximately one thousand farms compared to the year 2010. In Finland, cold winters limit crop production potential but decrease the need for pesticides. Due to rainfall during summer months, irrigation is needed only occasionally. Everything On "Organic farming in Finland" in One Document: Edited and Divided into Handy Chapters. Including Detailed References.